Miami coach Mark Richt has announced he will retire, a stunning decision made after three years leading his alma mater and with five years remaining on his contract. CORAL GABLES, Fla. (AP) — Mark Richt said he wants Miami to experience greatness again. And he decided someone else will have to lead the Hurricanes there. 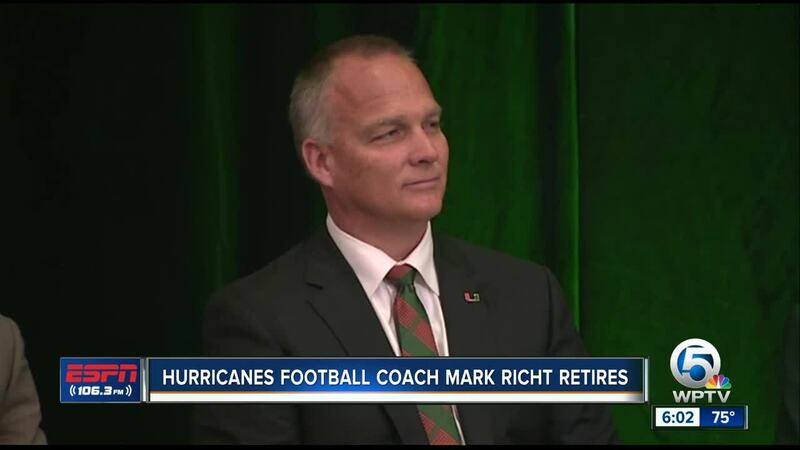 Surprising his boss, his staff and his players, Richt announced his retirement as the Hurricanes' coach Sunday — days after the end of an underachieving season, and with five years left on his contract. "My love for The U is simply great," Richt said in a statement. "My true desire is for our football program to return to greatness, and while terribly difficult, I feel that stepping down is in the best interests of the program." Richt, 58, told his staff Sunday morning, and informed athletic director Blake James of his decision around the same time. With players away for the holiday break, Richt and James alerted them by text and email shortly before the school issued a news release. Through Saturday, Miami was ranked fifth nationally in total defense this season and 18th in scoring defense out of the 130 teams at the FBS level. The Hurricanes were 67th in scoring offense, 104th in total offense and 112th in passing offense — all areas in which Miami expected to excel when it hired Richt in 2015. The year clearly took a toll. Miami lost four straight games midway through the season, with Richt calling that time "probably the most difficult time that I have been through as a coach." Confusion reigned after Richt's announcement. Some assistant coaches and staffers who walked into the building that houses the football offices expressed shock. Tight ends coach and special teams coordinator Todd Hartley walked out of the building and got into his vehicle, shook the hand of a well-wisher in the parking lot and shrugged. Some members of Richt's staff turned down other jobs in recent days to stay with him. They'll likely soon be looking for work elsewhere. "I want to express my sincere appreciation to the entire Hurricane family for welcoming me back home and for supporting the outstanding young men in our program," Richt said in the statement. "I only wish that we could have achieved greater things in return." Players took to social media to express shock. "I'm sick," wide receiver Brian Hightower wrote. Tight end Brevin Jordan tweeted at James, expressing hope that Hartley is retained. Former Miami wide receiver Sam Bruce, who was dismissed by Richt in 2016 for violations of team policy, said he would like to return to the school. Richt said he was not forced out, and that the decision to retire was his. He was 26-13 at Miami, and 171-64 in 18 seasons between Georgia and the Hurricanes. James said he will now aim to "go and get the best person for the job." Defensive coordinator Manny Diaz, who likely would have been a strong candidate for the job — and may get approached by the Hurricanes now anyway — left Miami earlier this month to take over as coach at Temple. Several underclassmen also are considering leaving Miami early for the NFL draft, and running back Travis Homer signed with an agent Sunday. Richt gave no indication that he was considering an early exit. He arrived at Miami in December 2015, spearheaded the building of an indoor practice facility that opened earlier this season and signed an extension in May that kept him under contract through 2023. He was making just over $4 million annually. "The decision came after a great deal of thought, discussions with my family and prayer," Richt said. "This was my decision."